Register for the conference at the regular price and you can bring another writer ... Free! (Can not be combined with any other discount, or offer. Keynote Speaker Address Lunches are optional extra. Available for a limited time, and may end without notice.) All applications subject to the Terms and Conditions of the conference. 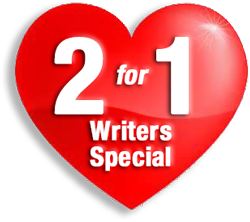 WC2 is pleased to offer you and a writing partner, loved one, or writer friend a special discount to help make the conference more affordable. For a limited time•*, when you register at the regular (door/walk-up) rate, a second writer can attend... FREE! You may treat either your BFF (Best Friend for Free), or split the cost and each get 50% off. See pricing below. This "Two for the Price of One" rate may NOT be combined with any other offer. Does not include other optional extra-fee activites. (Cannot be combined with any other discount, or offer. Keynote Speaker Address Lunches are optional extra on some plans. Available for a limited time, and may end without notice.) All applications subject to the Terms and Conditions of the conference. SF/F, YA, Self-help, memoirs, screenplays, etc. Accomplished (you are a published author, paid writer, etc.) Please select one to help us assess which track you are likely to attend. Yes, you may change at any time. West Coast Writers Conferences, (WC2) is a Todaro Communications, Inc company. All rights reserved.